Privacy has always a big concern for users using Facebook and with all the news about user account leaks and data falling into wrong hands makes even the sober person wary. 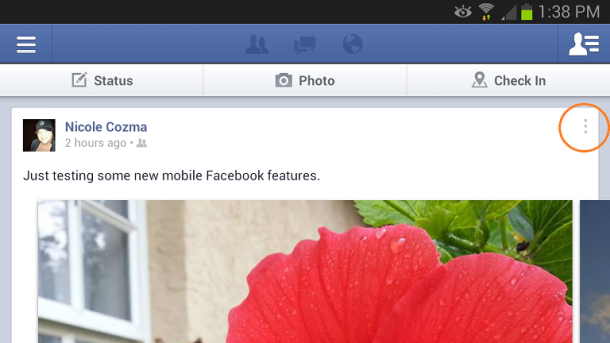 Facebook 3.3 for Android has a built in button which allows you to control what you want to share and who you want to share it with. Before sharing this information with you, I request you to kindly check whether you Facebook has been updated to v3.3. You can do that by going into the Application Manager : Settings > Applications and find Facebook in the list. When you tap it, the version number will be displayed in the top area of the screen. And if you have Facebook v3.3 on your Android, follow this simple and easy steps to control your posts. After you make an post on FB, just tap the three dots appearing on the top right corner. Taping it will open a menu which will have Edit Privacy listed. Tap Edit Privacy and select the persons you want to share your FB post with. That's it. Next time you make a post on Facebook from your Android remember theses simple and easy steps.